There are many kinds of materials for insulating I-pultrusion sticks, which can be divided into three categories: gas, liquid and solid. Commonly used gas insulating materials are air, nitrogen, sulfur hexafluoride insulated PC film, and the like. The liquid insulating materials mainly include mineral insulating oil and synthetic insulating oil (silicone oil, dodecylbenzene, polyisobutylene, isopropylbiphenyl, diarylethane, etc.). Solid insulating materials can be divided into organic and inorganic types. Organic solid insulating materials include insulating paint products, insulating rubber, insulating paper, insulating fiber products, plastics, rubber, varnish paint tubes and insulating impregnated fiber products, electrical films, composite products and adhesive tapes, laminates for electricians, and the like. 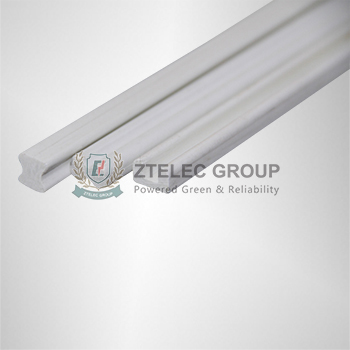 Inorganic solid insulation materials mainly include mica, glass, ceramics and their products. In contrast, solid insulation materials are diverse and most important. Insulating materials for high voltage electrical equipment such as high voltage motors, high voltage cables, etc., require high breakdown strength and low dielectric loss. Low-voltage electrical appliances are mainly required for mechanical strength, elongation at break, and heat resistance. The macroscopic properties of insulating materials such as electrical properties, thermal properties, mechanical properties, chemical resistance, weather resistance, corrosion resistance, etc. are closely related to its chemical composition and molecular structure. The inorganic solid insulating material is mainly composed of silicon, boron and various metal oxides. It is mainly composed of ionic structure. The main features are high heat resistance, working temperature is generally greater than 180 ° C, good stability, resistance to atmospheric aging and resistance. Chemical properties and long-term aging performance under the action of electric field; but high brittleness, low impact strength, high pressure resistance and low tensile strength; poor processability. The organic material is generally a polymer having an average molecular weight of between 104 and 106, and its heat resistance is generally lower than that of an inorganic material. A material containing an aromatic ring, a heterocyclic ring, and an element such as silicon, titanium, or fluorine has higher heat resistance than a general linear chain polymer material. The most important part affecting the dielectric properties of insulating materials is the strength of the molecular polarity and the content of polar components. The dielectric constant and dielectric loss of polar materials are higher than those of non-polar materials, and it is easy to adsorb impurity ions to increase conductance and reduce its dielectric properties. Therefore, it is necessary to pay attention to cleaning and prevent pollution during the manufacturing process of insulating materials. Dielectrics for capacitors require a high dielectric constant to increase their specific characteristics.